Esport News | Filling the void - Who will join Aphromoo at 100 Thieves? Filling the void: Who will join Aphromoo at 100 Thieves? Newly franchised NA LCS squad 100 Thieves are one player away from finalizing their roster for 2018. But, who will it be? As Nadeshot made the announcement for 100 Thieves getting a LCS spot just a few months back, there were a lot of questions from LoL fans over who would represent the newly established team. Last month, 100 Thieves put pen to paper on three new players as Ssumday, Ryu and Meteos were announced at Top, Mid and Jungle respectively. With the stalling of Aphromoo signing a contract with CLG after Huhi, Stixxay and Darshan all resigned, the writing was on the wall for the long time LCS veteran as it was time for greener pastures within the NA region. Aphromoo’s recent dip in form this past season led to the replacement of Biofrost in the CLG bot lane. The unwillingness to retire from a player that has nothing to prove within the NA scene shows there is still a competitive drive to succeed. Going forward, Aphromoo will need a premier talent to lift himself back up to his esteemed form as the bot lane competition in NA has intensified. After a few reddit threads started making the rounds about who could possibly team up with Aphromoo in the near future, the shortlist at AD seems to be Cody Sun, Keith, and none other than Imaqtpie as leading candidates. There was an alleged ‘leak’ from Aphromoo on his twitch stream over who would fill in as his duo partner, making references to Cody Sun, but also trolling his viewers with a rumor of Imaqtpie making a long-awaited LCS return. Of all these options, Cody Sun is by far the most viable of 100 Thieves are adamant about making a playoff run right from the start. His prowess on late game ADC’s last season proved the difference maker several times on an already stellar Immortals team. 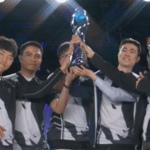 As Cody Sun enters his sophomore season, a legendary laning partner like Aphromoo would do well to make his potential grow even higher.